In 1982, Nestle, in its effort to procure locally, approached Paras Enterprises (now Paras Spices Pvt. Ltd.) for its spice requirements. Thus began our journey from being a local supplier of spices to a supplier of International quality savoury ingredients. After taking the first step in 1982, with Nestle, Mr. Viney Budhiraja has been ceaselessly working towards building a class of savoury ingredients that are unparalleled in taste, quality and safety. Over the years, Paras has grown from just being a commodity vendor to an associate partner of major global consumer brands across 15 countries. A pioneering vision and a relentless commitment to quality, have made Paras a bonafide producer of premium food ingredients. Our mission is to meet the values and demands of customers through a sustainable process, keeping an eye out for the needs of the future. As a leading manufacturer, Paras has a vast range of products in its basket including spices & herbs, seasonings, dehydrated vegetables, chicory and an extensive range of specialty food ingredients. We procure our raw materials through a sustainable sourcing program that competently meets the global standards and customer’s expectations. Backed by state-of-the-art manufacturing facilities, skilled professionals and years of expertise, we have touched lives with an impeccable taste of our products. Being a forerunner, we are an indispensable part of the food value chain. We have a complete in-house spice processing and food solution facility which enables us to provide the best of quality from gate-in to gate-out. The company has always been pro-active in adopting the latest technologies and this has been one of the major factors contributing to our success. 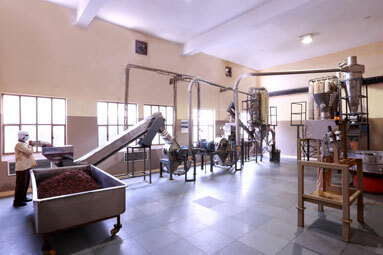 In 2004, we were amongst the first few to introduce steam sterilized spices in India. We are certified to BRC Issue 7, FSSC 22000 standards and standards which are compliant with the Global Food Safety Initiative.